You are buying Enfamil 24 Baby Formula With Iron Ready To Use 2oz 48-Pack, Model #4985297. 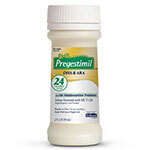 ADW Diabetes offers a complete line of Enfamil baby formula products both in liquid and powder form. We offer these items in both single and discounted bulk quantities for your convenience.Shop with ADW Diabetes as we provide excellent customer service, low prices, and fast shipping! The Enfamil Premature 24 Cal Baby Formula With Iron Ready To Use 2oz 48-Pack has high levels of some nutrients to help promote catch up growth and support a developing immune system. Milk-based infant formula for premature or low birth weight infants. Levels of calcium, phosphorus and vitamin D within the ranges recommended by experts for bone mineralization and growth. Includes our blend of DHA and ARA, two nutrients also found in breast milk. Water, Nonfat Milk, Corn Syrup Solids, Lactose, Medium Chain Triglycerides (MCT Oil), Whey Protein Concentrate, Soy Oil, High Oleic Vegetable Oil (Sunflower and/or Safflower) and Less Than 0.5%: Mortierella Alpina Oil(ARA), Crypthecodinium Cohnii Oil(DHA), Mono- And Diglycerides, Carrageenan, Vitamin Hydrochloride, Riboflavin, Vitamin B6 Hydrochloride, Vitamin B12, Niacinamide, Folic Acid, Calcium Pantothenate, Biotin, Sodium Ascorbate, Choline Chloride, Inositol, Calcium Carbonate, Calcium Chloride, Calcium Hydroxide, Calcium Phosphate, Magnesium Phoshpate, Ferrous Sulfate, Zinc Sulfate, Cupric Sulfate, Potassium Iodide, Sodium Citrate, Sodium Chloride, Potassium Citrate, Taurine, L-Carnitine, Nucleotiedes (Adenosine 5'Monophosphate, Cytidine 5'Monophosphate, Disodium Guanosine 5'-Monophoshpate, Disodium Uridine 5'-Monophosphate).